Have you ever encountered a coyote…..? maybe or maybe not. 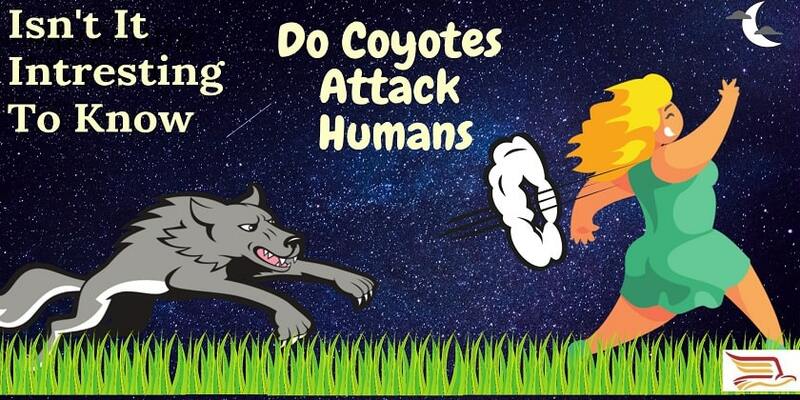 If your question is, do coyotes attack humans…? Then this post is going to be very informative and helpful for you in both of the conditions. Yes, coyotes do the attack on human but very few. There are conflicts between humans and coyotes since they have entered in urban places. Coyotes attack humans very rarely. There are only two confirmed deaths a year in Canada and the United States. Normally they are timed and confine themselves to rural and forest areas. They are now surviving in urban and other populated areas. But it is possible that you may encounter the coyote in the wind or in your neighborhood. If you are really interested in to know what do coyotes eat during the day and night, then you love these interesting facts which I include in this post. According to the data of USDA’s Wildlife Services, in the 30 years leading up to March 2006, 160 attacks occurred in the United States. Most of them were in the Los Angeles region. 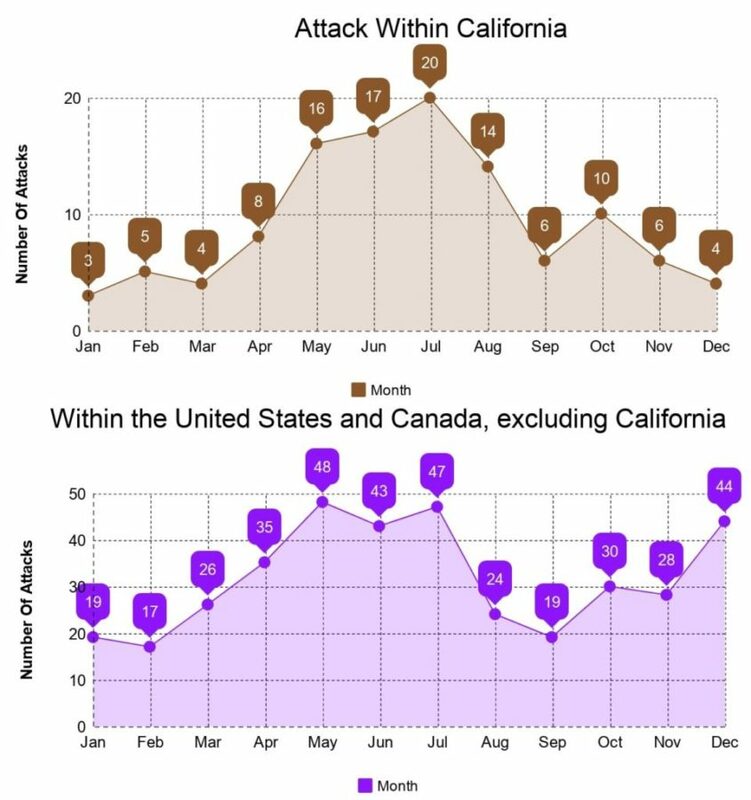 Data from the USDA’s Wildlife Services and the California Department of Fish and Wildlife, show that 41 attacks occurred during the period of 1988–1997. from 1998 to 2003, there are 48 attacks were noted. Their research shows that these incidents majorly occurred in Southern California near the suburban-wildland interface. According to the Urban coyote research project analysis was conducted on coyotes attacks on humans in the United States and Canada, including 142 reported incidents of coyote’s attacks resulting in 159 victims. You might have this question, do coyotes attack humans?… Most of the coyotes are no longer afraid of humans. There are reports of increased coyote sightings in the urban and suburban area according to the recent researches. They do not immediately run away when encountering humans and becoming habitual to the presence of humans. Some coyotes have started to act aggressively toward humans, chasing bicycle and joggers. They have begun confronting people walking their dogs and stalking small children. Humans increase the likelihood of conflicts with coyotes because they are feeding the animals directly. They are giving them access to garbage, pet food, and other food remnants. Humans are not in the coyote’s diet, but they may readily attack young children that are unattended. One more interesting fact about this feeder is, they prefer to stay away from large predators, including humans. They commonly “shadow” humans passing through their territory to ensure that if somebody bothers their den. The conflict happens on August 26, 1981, when an urban coyote grabbed a three-year-old girl named Kelly Keen. She was in the driveway of her mother and father’s home in Glendale, California. The animal scribbled her across the street. Kelly keen was rescued by his father, by chasing the animal away and rushed her to Glendale Adventist Medical Center. Unfortunately, she died in surgery due to blood loss and a broken neck because of the incident. On October 27, 2009, two eastern coyotes killed a nineteen-year-old singer-songwriter named Taylor Mitchell. Taylor was at Cape Breton Highlands National Park in Nova Scotia, at the time of the attack. She was on a break from her concert tour when they approached stealthily and chased her down on the Skyline Trail. The victim was airlifted by an air ambulance to Queen Elizabeth II Health Sciences Centre. she died after midnight from severe injuries and blood loss that was sustained during the assault. On June 28, 2010, a coyote leaped on a 12-year-old girl in Spring Valley. The girl fell backward and stricken her elbow, but she was not bitten. On July 18, 2013, at Forest Lawn Cemetery in Cypress, a 2-year-old girl was attacked by a coyote when she was playing about ten feet away from her mother. Mother was visiting her grandmother’s grave. The coyote accompassed the playing child and started to drag her off into the bushes. It dropped the child and ran away when “lunged at” by the mother. The child was hospitalized for a 2.5-inch gash to the leg and began inhibitory treatment for rabies. Three coyotes were killed by the authority at the cemetery same day after the incident. On October 14, 2013, on a dark road just outside Niwot, Colorado in Boulder County, three coyotes attacked a 22-year-old man who was walking to work. The man focused on keeping his balance, wielding his flashlight with one arm and pushing the coyotes with the other, keeping the animals in front of him, protecting his neck and face, and retreating. The coyotes circled, dodged, and attacked in turn, lunging at his throat, biting, clawing, and landing leaping body-blows. He was treated for multiple bleeding cuts and abrasions to the arms, head, face, and neck. On January 12, 2015, in Ladera Ranch, outside a baby girl’s residence, a coyote with a limp tried to attack the girl when she was in her mother’s arms. The child was saved by her mother who fought with the animal. After that incident, the animal killed two dogs and was being pursued by authorities. On May 22, 2015, in Irvine park, a 3-year-old girl was picking up after their dog that she, her twin sister, and her mother had been walking. A coyote came out of a hedge and bit at the neck of the 3-year –old girl. She was saved by her mother and other nearby adults. After the attack, the Department of Fish and Wildlife were trying to track coyote. Before the attack, a girl had already been chased by the coyote in the same area. There are some incidents you have read above. In most of them, the coyote tried to hurt children. Coyotes afraid to prey on the animals bigger in size. Coyotes attack humans very rarely but you need to make your surroundings inhospitable for coyotes. Keep trees and shrubbery neatly trimmed to eliminate hiding places for the animal. Do not leave food outside of your home or nearby the house. The possibilities of conflicts with coyotes are increased by the human. Because they have started feeding them directly and by giving them access to garbage, pet food, and other food remnants. Secure the garbage and compost bins with rope, chain, bungee cords or weights to keep coyotes from getting in. Prepare for encounters with coyotes if you frequent their natural habitat or you are at the place where coyotes are seen so often. If you are hiking, bring a large stick or umbrella with you in case of attack. It is also useful to have noisemakers, like air horns and whistles, easily on hand in order to scare them. Vessels filled with chemical solutions, such as pepper spray or a vinegar-filled water gun can be also used. Do not leave your children and pets alone in the park or outdoor. Especially when you are living in the area with possibilities of seeing coyotes. Do not try to approach or frighten a coyote if you see one in the wilderness. Educate children about what to do if they encounter a coyote on their own at home or in the wild. What to do if a coyote attacks someone? Escalate your response only if a coyote comes closer. Keep in mind that most coyotes prefer to stay away from large predators, including humans. Try to hazing to scare the animal away from you. Make you look as big, powerful, and aggressive as possible. Wave your arms above your head and shout out loud and authoritative tone in order to frighten the coyote into digressing. Things that appeal to multiple senses, including different lights, sounds, and motions can be used. Stand on your place instead of running. Make eye contact and haze until the coyote retreats. Be consistent in your behaviors and mannerisms and make sure to allow room for the animal to escape. Throw objects such as sticks and rocks to make the coyote feel unwelcome and propel it to leave you alone. Spray a hose or water gun and make loud noises, if you are approached by a coyote in your area. Never run away from a coyote, this increases the possibilities of being attacked. Coyotes show their aggression by growling. Try to throw sticks or clumps of dirt if the coyote becomes aggressive. Avoid aiming to strike the coyote’s head, it may intensify the aggression of this animal. Try to back away from the animal and continue to be loud and bold. If animal attacks you, try to protect your throat and arteries. These parts of the body are susceptible to serious injury and blood loss through biting. Coyotes attack humans very rare if it happens with you, consult immediately a doctor or other medical professional if you have been attacked. Let us know in the comment section if this article about do coyotes attack humans is helpful for you. Besides that, you can also share your experience while encountering the coyote.